When "Jackass the Movie" was released in 2002, people were outraged. Critics called it "a new low," "a plunge into depravity," "a sad commentary on our degenerating culture" and "a disgusting, repulsive, grotesque spectacle." Unfortunately for them, here comes "Jackass Number Two." 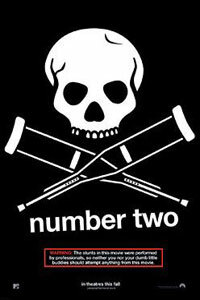 Simultaneously raising the stakes and lowering the bar, "Jackass Number Two" unleashes the cast and crew as they get even uglier around the globe.